Until October 2017, Warframe was a largely linear dungeon crawler. That all changed with the introduction of the Plains of Eidolon, its first open area. But the game has changed a lot even in the year-and-a-half since the Plains arrived, and they’ve been in need of an overhaul. That overhaul has just gone live. Gameplay changes and new graphics tech developed for the game’s second open-world area, introduced in last November’s Fortuna expansion, have been retrofitted to the Plains of Eidolon. This includes improved, dynamic lighting and shadow changes that work with the day-night cycle, sending god rays through more detailed trees, bush, and fog. On the gameplay side, you can expect resurfaced terrain to better accommodate your K-Drive hoverboards, and a new Grineer menace – the “wily” Tusk Thumpers. You’ll now find three of these stomping around the plains and smashing the ground. Mention of a conservation system under which you’ll “help get new animals to safety” suggests that whatever they’re up to, it’ll have a harmful effect on the ecosystem – unless you stop them, that is. As with all things Warframe, this update is completely free. It should be live on PC via Steam now (and is coming to consoles soon). Warframe has just celebrated its sixth anniversary, and announced as part of the festivities that it has almost 50 million registered players. 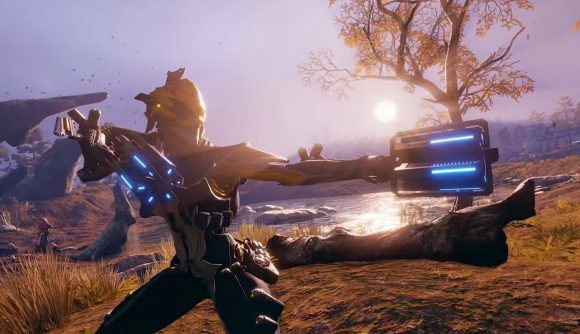 Most of those signups happened during 2018, and were helped along by a Switch launch and a diligent update schedule which included the massive Fortuna expansion.